Internal agent for the RVO system. Usually you will interface with the IAgent interface instead. Reads public properties and stores them in internal fields. This is required because multithreading is used and if another script updated the fields at the same time as this class used them in another thread weird things could happen. Will also set CalculatedTargetPoint and CalculatedSpeed to the result which was last calculated. Populate the neighbours and neighbourDists lists with the closest agents to this agent. Set the current velocity of the agent. This will override the local avoidance input completely. It is useful if you have a player controlled character and want other agents to avoid it. Calling this method will mark the agent as being externally controlled for 1 simulation step. Local avoidance calculations will be skipped for the next simulation step but will be resumed after that unless this method is called again. Point towards which the agent should move. Target point in world space (XZ plane or XY plane depending on if the simulation is configured for 2D or 3D). Note that this is a Vector2, not a Vector3 since the system simulates everything internally in 2D. So if your agents move in the XZ plane you will have to supply it as a Vector2 with (x,z) coordinates. Desired speed of the agent. In world units per second. The agent will try to move with this speed if possible. Max speed of the agent. In world units per second. 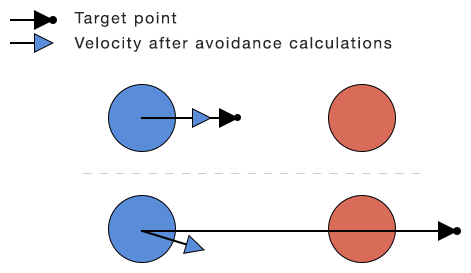 If necessary (for example if another agent is on a collision trajectory towards this agent) the agent can move at this speed. Should be at least as high as desiredSpeed, but it is recommended to use a slightly higher value than desiredSpeed (for example desiredSpeed*1.2). Usually you set this once per frame. The agent will try move as close to the target point as possible. Will take effect at the next simulation step. The system assumes that the agent will stop when it reaches the target point so if you just want to move the agent in a particular direction, make sure that you set the target point a good distance in front of the character as otherwise the system may not avoid colisions that well. What would happen is that the system (in simplified terms) would think that the agents would stop before the collision and thus it wouldn't slow down or change course. See the image below. In the image the desiredSpeed is the length of the blue arrow and the target point is the point where the black arrows point to. In the upper case the agent does not avoid the red agent (you can assume that the red agent has a very small velocity for simplicity) while in the lower case it does. Where remainingPathDistance is the distance until the character would reach the end of the path. This works well because at the end of the path the direction to the next waypoint will just be the direction to the last point on the path and remainingPathDistance will be the distance to the last point in the path, so targetPoint will be set to simply the last point in the path. However when remainingPathDistance is large the target point will be so far away that the agent will essentially be told to move in a particular direction, which is precisely what we want. Max number of estimated seconds to look into the future for collisions with agents. As it turns out, this variable is also very good for controling agent avoidance priorities. Agents with lower values will avoid other agents less and thus you can make 'high priority agents' by giving them a lower value. Optimal speed of the agent to avoid collisions. The movement script should move towards CalculatedTargetPoint with this speed. Optimal point to move towards to avoid collisions. The movement script should move towards this point with a speed of CalculatedSpeed. This is a Vector2, not a Vector3 as that is what the SetTarget method accepts. Will always draw debug info in the XZ plane even if Pathfinding.RVO.Simulator.movementPlane is set to XY. Ignored if multithreading on the simulator component has been enabled since Unity's Debug API can only be called from the main thread. Coordinate which separates characters in the height direction. Since RVO can be used either in 2D or 3D, it is not as simple as just using the y coordinate of the 3D position. In 3D this will most likely be set to the y coordinate, but in 2D (top down) it should in most cases be set to 0 since all characters are always in the same plane, however it may be set to some other value, for example if the game is 2D isometric. The position is assumed to be at the base of the character (near the feet). Agents are modelled as circles/cylinders. Locked agents will be assumed not to move. Max number of agents to take into account. Decreasing this value can lead to better performance, increasing it can lead to better quality of the simulation. Number of neighbours that the agent took into account during the last simulation step. Max number of estimated seconds to look into the future for collisions with obstacles. The agent does not move by itself, a movement script has to be responsible for reading the CalculatedTargetPoint and CalculatedSpeed properties and move towards that point with that speed. This property should ideally be set every frame. Note that this is a Vector2, not a Vector3 since the RVO simulates everything internally in 2D. So if your agents move in the XZ plane you may have to convert it to a Vector3 like this. Callback which will be called right before avoidance calculations are started. Bias towards the right side of agents. Rotate desiredVelocity at most [value] number of radians. 1 radian ≈ 57° This breaks up symmetries. Desired target point - position. Evaluate gradient and value of the cost function at velocity p.
Used internally for a linked list. Simulator which handles this agent. Used by this script as a reference and to prevent adding this agent to multiple simulations. Traces the vector field constructed out of the velocity obstacles. Returns the position which gives the minimum score (approximately). Extra weight that walls will have.